Launching a successful startup is hard work. Launching a successful startup in an environment which lacks a supportive local business ecosystem and startup friendly government, can become nigh on impossible. Even in the startup mecca of Silicon Valley, guns remain less regulated than startups, and early stage companies continue to have their feet tied together with red tape, bureaucratic practices, and strict government regulations that limit their potential for growth. But while the governments of the world’s most advanced economies are still holding startups back on the starting line, administrations in emerging markets are recognizing the economic benefits of accessible entrepreneurship, and adopting startup friendly policies that better help businesses flourish. 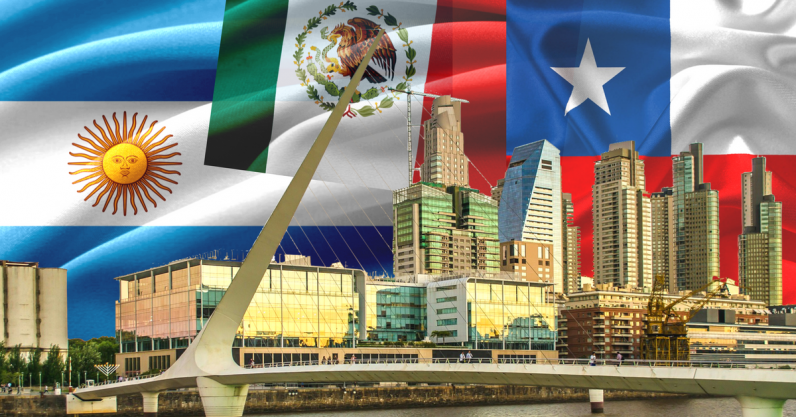 Over the last five years, Latin America — home to massive markets such as Brazil and Mexico — has produced a number of homegrown unicorns, and started to grab the attention of foreign investors, and startup organizations looking to get their piece of the pie. However, despite a move in the right direction by a handful of LatAm’s strongest economies, a recent UN report raises concerns that the region is falling behind in terms of innovation. From an early stage, the powers that be in Mexico were set on developing their country as a startup hub. Early government involvement started with the formation of TechBA, a program created in 2004 by Mexico’s Secretary of Economy and the US-Mexico Foundation for Science (FUMEC), launched with the aim of “strengthening the entrepreneurial, technological and innovative capacities of small and medium sized technology-based companies” and to help startups scale their products and great ideas into foreign markets. As early as 2006, TechBA began to select batches of Mexican startups to take part in an exchange program in Silicon Valley, to experience the entrepreneurial buzz of ‘the Bay,’ and bring this energy back to their own early stage ecosystems. However, it was the launch of the independent government policy center, the National Institute of Entrepreneurship (INADEM), in 2013, that has proven to be most influential for early stage startups. Just one year after it’s launch, INADEM pumped as much as $658M into the local ecosystem, spread between as many as 620,000 entrepreneurs, micro, small, and medium businesses, leading to the launch of as many as 6,000 new companies and 73,000 new jobs. But the government input is not solely monetary. The government has also rolled out legislation which facilitates the process of launching a business. In September 2016, the government made changes to ‘La Ley General de Sociedades Mercantiles’ which made it possible to register any enterprise with an annual revenue of up to 5 million pesos — US $300,000– at no cost in 24 hours. The government also organizes an annual Entrepreneur Week, which features conferences and startup events designed to bring to local ecosystem together, to cooperate, build and learn together, and Reto Zapopan, a government-funded advertising agency and accelerator hosts yearly batches, and holds regular workshops and events. During previous administrations, Argentina’s government might have been considered a barrier to business growth. Fortunately, times have changed, especially since President Mauricio Macri took office back in 2015. Since then, the government has taken upon itself to create policies that recognize the importance of entrepreneurs for the country’s economy, and facilitate the growth of small to medium sized businesses. ‘The Entrepreneur’s Law,’ which was passed in March 2017 is an example of this. It enables growth within many areas of the startup community — including the implementation of specific tax breaks and incentives for individuals, corporations, and institutional investors. It also provides contributions to 13 accelerator programs, enabling of public crowdfunding, and the creation of a government-run fund. The beating heart of the startup ecosystem in Argentina is the city of Buenos Aires, where the local government has created various initiatives for the entrepreneur community. The latest addition is their global incubator fund IncuBAte, which is currently carrying out the selection process. The program which was open to startups from around the world, will provide up to $30,000 USD equity free seed funding for early stage startups, as well as assistance registering, and launching businesses locally. Additionally, Buenos Aires has introduced Academia Buenos Aires Emprende, an initiative to educate citizens about enterprise and business building, demonstrating a desire to promote and enrich the startup ecosystem, not only for local residents but also as a symbol for Latin America and the global startup scene. Just like Argentina, Chile’s economy seriously suffered during the 1980s. However thanks to the government’s engagement in the startup community over the last decade, the country has turned into an entrepreneurial beacon for the continent. The government’s introduction of Start-up Chile has done wonders for the local ecosystem. Government backed Start-up Chile seeks to attract early-stage, high-potential entrepreneurs to bootstrap their startups using Chile as a launchpad to go global. This has catapulted Chile into the global limelight of the startup scene, not only defining it as an entrepreneurial leader within South America, but also around the world. Chile contributed upwards of $40 Million to 1,300 promising business from close to 80 countries, between 2010 and 2016. To add to this, these companies have generated roughly 1,600 jobs in the country and $100 Million in outside funding. Additionally, Chile has a law that allows entrepreneurs to incorporate a business in just one day, in one step, and for free. According to the Brookings Institute, some 200,000 Chileans have received benefits in one form or another from government-backed entrepreneurship programs. Key startups include Smartraining, Drivin, and Edoome. Mexico, Argentina, and Chile have set a positive example for startup friendly administrations which has spread across Latin America and further afield. From Ruta N in Medellin, Colombia, to Parallel 18 in Puerto Rico, we are witnessing an infectious positivity flowing from local governments in support of developing strong local startup ecosystems, which is creating benefits for entire countries, economies and societies. As more established tech hubs become saturated, making it harder to find talent and raise funding, and protectionist governments continue to build walls, sign Brexits, and reduce startup VISAs, startups are inevitably going to start looking further afield in search of their potential launch pads. To woo them overseas, we are likely to see more ‘emerging’ economies in LatAm follow suit with startup friendly policies, and inclusive backed accelerators and funds. Rather than trailing behind, we could well see LatAm pushing ahead in creating startup fuelled model for economic repair and regrowth, to be adopted by European countries still struggling to recover from the great recession. At this years World Economic Forum in Davos, Argentine president Macri’s vision for a more inclusive future in the global economy was shown clearly, when he warned of the risks of protectionist policies, stating “don’t cry for us, learn from us.” So watch this space, as Peru, Colombia, and other neighboring countries are slowly but surely making their way onto the startup map too.